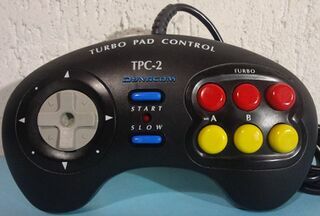 The TPC-2 (TPC standing for "Turbo Pad Control") is an unofficial third-party controller for the Sega Mega Drive, created by Dynacom. It is a three-button controller, with the regular , and buttons (yellow colored), plus the same three buttons with turbo features (red colored). It also has a "slow" button and comes with an attachable thumbstick bundled. The TPC-2 is the second in a "series" of control pads by Dynacom, each being designed with a different console in mind (the TPC-1 was built for the Dynavision (an Atari 2600 clone), the TPC-3 for the Phantom System and other similar NES clones, the TPC-4 for the Sega Master System, the TPC-5 for the Super NES and the TPC-6 for the real NES (or at least consoles with a NES plug). A seventh variation was released named TPC Superfighter, also for the Mega Drive.